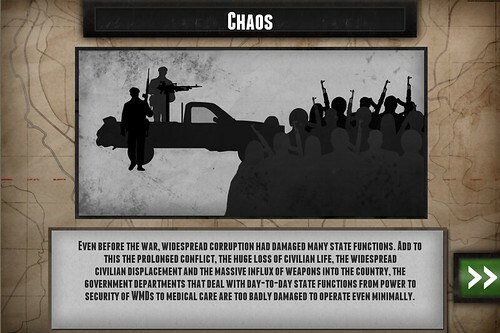 Games for Change is a yearly Game Festival and also maintains a website of “Games For Change.”Here are also some mobile games from Games for Change. 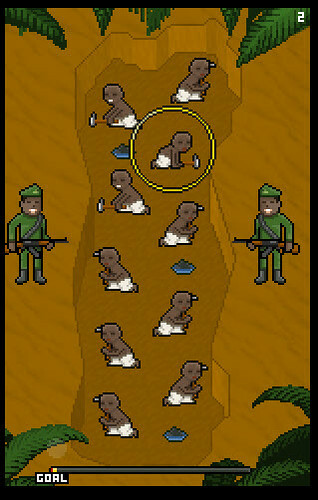 Based on a search for mobile these games appear to be playable from a mobile device. If you play one of them do you see Fun, Flow and Fiero? Keller’s ARCS model of Attention, Relevance, Confidence and Success? So looking at these as an educator – would you use one of these or keep looking? For an iPhone, iPad, or iPod, you hold the power button while you tap the front button. The screen will flash white and the device will make a camera sound. The screenshot will be available in your camera roll gallery. Hope that helps! I purchased and downloaded Phone Story, [$1.00 cost on ANDROID] no wonder it is banned in the iTunes store. It does require the downloading of Adobe Air. Since I cover the factories producing the iPhone in China, this was of interest to me. This game certainly does raise awareness and there is a pc version. You can also play online. It certainly takes you through the raw-materials and the problems at the imaginary FOXCONN, especially the rash of suicides, FOXCONN's answer was to put extended horizontal screens out around the building between the first and second floor to catch the would-be suicides. Even though it is just a game, it graphically portrays some of the inherent problems of our desire for technology at any cost. Phone Story stood out to me too. I like that it changes up the minigame modes, and it matches the mechanics to the messages it's trying to portray quite well. Having the voiceovers play over the gameplay keeps people from losing patience during a longwinded preachy monologue. 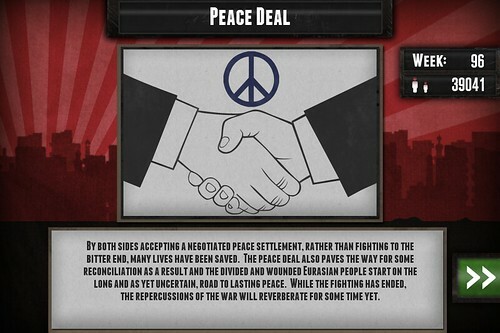 Some "propaganda games" are very bad at these things. PETA is especially notorious for simply re-skinning platformers, making games that are good for marketing, but not really good at being games in and of themselves. 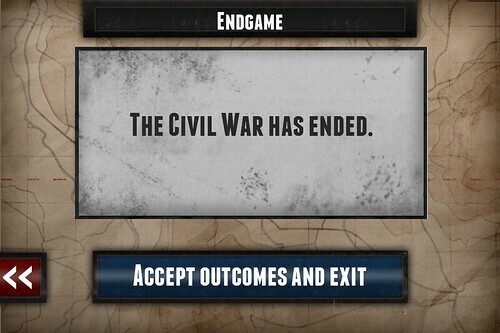 I tried out Endgame: Eurasia. The Apple Store gave the developers so much kickback that they had to rename everything in the game, including the game (See this article for more info)! I have to say, I didn't grow up with turn-based card game. The closest I ever came was a dungeon crawler game back in the day named Morder: Depths of Dejenol. That mechanic just kind of threw me to start with. I never really experienced flow in terms of being at the "top of my game" in this because the mechanic seemed kind of artificial to me. It was pretty text heavy as well, although not as bad as some I've seen. It's well-written text, overall. The interaction is minimal, the graphics are static (although very cool looking), and there is no way to save your progress meaning each playthrough is unique. It might be good to spark discussion, though. I don't know that it would capture student's attention so much that they play it at home, though. It would be way more interesting to get students to design one of these styles of games than just play it, IMHO. 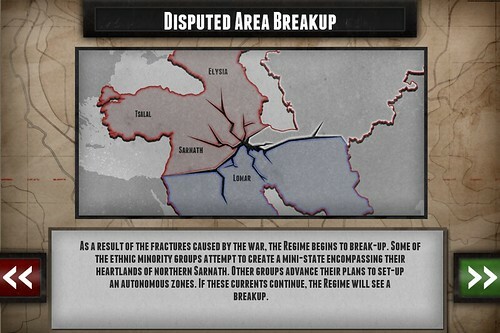 I also tried the Endgame: Eurasia game... I heard about the controversy over the Apple Store's denial of the game due to its proximity in content to current events in Syria... Not sure why that's an issue exactly. The "Syria" version looks like it's exactly the same. Each round has two phases -- the political phase and the military phase. The former requires choosing from available cards/choices that will maximize your support. After confirming your choices, you get a summary of results: how much your support went up or down. In the military phase, you choose the cards to do battle with the regime, and there are 6 different parameters to pay attention to. 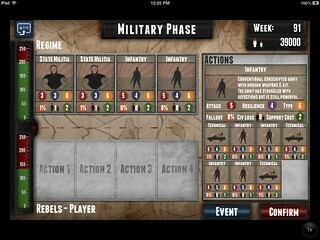 Gameplay in this phase seemed similar to CCGs like Magic: The Gathering with "Attack" and "Resilience" numbers to pay attention to when matching Rebels vs. the Regime. In fact, after a while I was simply focusing on these numbers and not really immersed in the narrative of the game. Support can be diminished more or less based on the tactic chosen. It seemed too soon in the game, and the flavor text suggested that it wouldn't be acceptable, so I passed and continued for another number of rounds. This might be useful in a social studies or global studies class studying the current conflict in Syria. 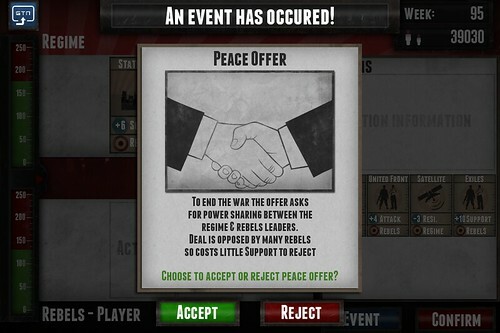 It would be interesting to see how the various outcomes (based on your decisions inside of the game) point to true possibilities for how the conflict will resolve. I would probably want students to journal about their decisions to make sure they were absorbing the narrative content and not just letting the game mechanic guide their decisions, as it seemed to do so for me. It has the advantage of going quickly... Its being text-heavy may not be a bad thing, especially if using it in an educational setting! (After all, aren't we trying to trick them into reading and enjoying the process while they're at it?!). From a Multimedia / Computer Science perspective, this has the advantage of being a game with very simple mechanics. For a programming course, students could break down a gamelike this into a flowchart or pseudo-code. For a graphic design course, students could redesign the "cards" or even repurpose them for a different game. I suppose a cross-disciplinary project could be done between a programming class, a writing class, and a design class using something like this as a base. I was very interested where they said they designed the game in two weeks. 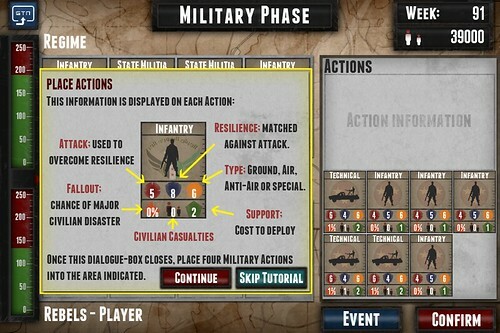 That means it has a solid game mechanic base (turn-based card games) from which to develop.